Eastlake Vistas is the most eastern of the Eastlake Communities. 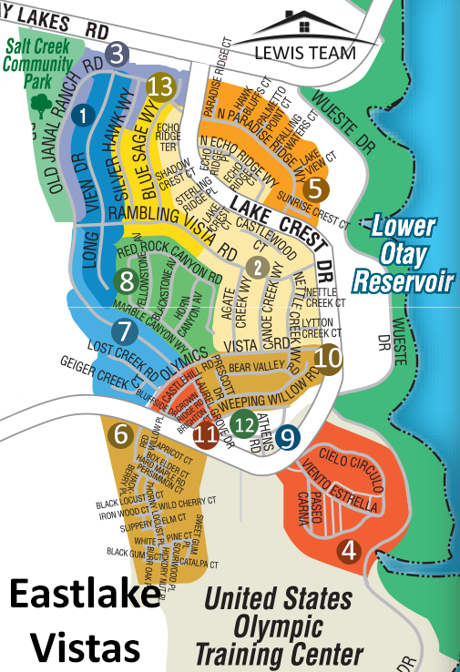 It has 2 really large parks; Mountain Hawk Park and Salt Creek Community Park. Eastlake Vistas has both condos and homes although most of the homes are quite large. There are also some gated communities in the Vistas. There are no Eastlake III Association pools in Eastlake Vistas but residence can use the pools and amenities in Eastlake Woods and Eastlake Trails. There are no schools located within the community of Eastlake Vistas. Many of the homes in Eastlake Vistas have wonderful views of the Lower Otay Lake and many more have views of the Jamul Mountains to the east. The western part of the Vistas slopes west and the other half is more of a level landscape. There is also a footbridge connecting Eastlake Vistas and Eastlake Trails. This gives easy access to the Eastlake Trails Pool. Eastlake Vistas is north of the Olympic Training Center, south of Eastlake Woods, east of Eastlake Trails and west of the Lower Otay Lake. Eastlake Vistas is in the Chula Vista ZIP Code of 91915. There is a mello-roos and an HOA. 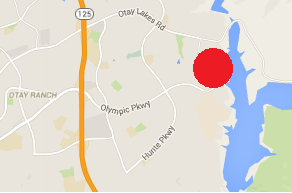 Interested in Eastlake Vistas Real Estate?